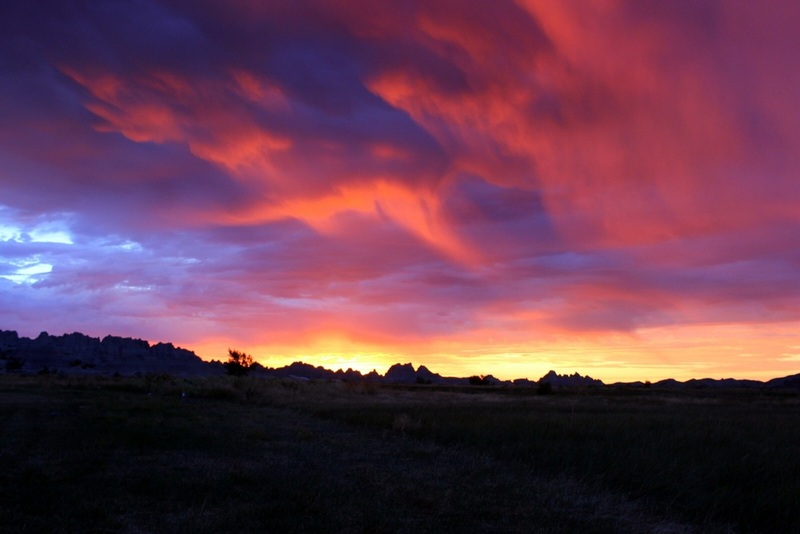 I slept very little the night before I left at sunrise for Badlands National Park. At around 3 a.m. in the Juniper Campground at Theodore Roosevelt National Park, I awoke to one of the loudest thunderstorms I've ever heard. The rain was pouring down and shaking my tent to no end. Every now and then, my tent would light up as the lightning bolts flashed across the sky. I started panicking. What if I hadn't put my rain fly on properly? What if my tent was leaking? Bleary-eyed, I put on my head lamp and surveyed the inside of my tent. Everything seemed fine. But the rain kept pounding down, and I was convinced that my campsite might flood. I don't remember when the rain stopped, but I didn't sleep a wink until then. At about 5:30, I was up. 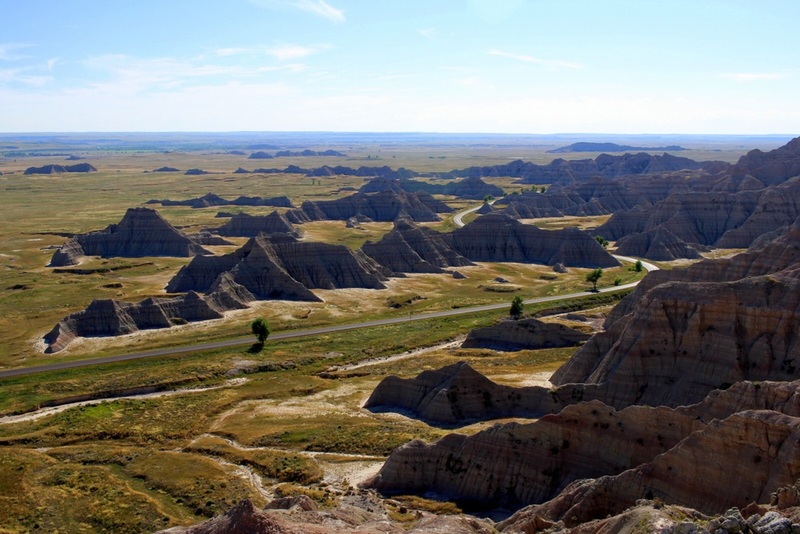 I knew I had a long day of driving to get to Badlands. My tent was in a muddy mess. I decided to forego cooking breakfast there. I just wanted to get out of the bog that my campsite had become. I tried my best to scrape off the mud from my tent before packing it, but it was hopeless (even today, 2 days later, the tent is still covered in dried mud). I was exhausted, hungry, and in need of caffeine. I set off for South Dakota at 5:55 not in the highest of spirits. As I was taking the road out of the park, however, I immediately noticed a large brown animal grazing just off the side of the road. 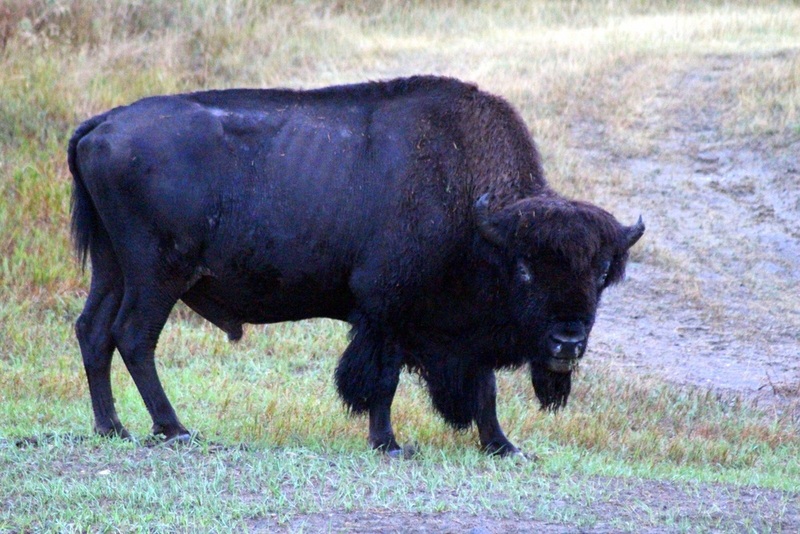 It was a bison. A bison having a more pleasant morning. I hit the road and cruised south. Though I'd started the morning in rough fashion, the scenery lifted my spirits. And I also can't discount how uplifting it is to drive on an open road. When I finally entered South Dakota, I saw, for the first time in my life, signs showing 80 mph as the speed limit. I took advantage of this opportunity to pass the miles quickly. After cooking pancakes at a roadside rest stop outside of Sturgis, I was within 2 hours of the park. In the final stretch, I saw dozens of advertisements for the "Wall Drug Store." They touted their 5-cent coffee. I'd also heard that their donuts were good. So I figured I'd stop by. The inside was a tourist trap. But it was still fun to see what paraphernalia people could get. 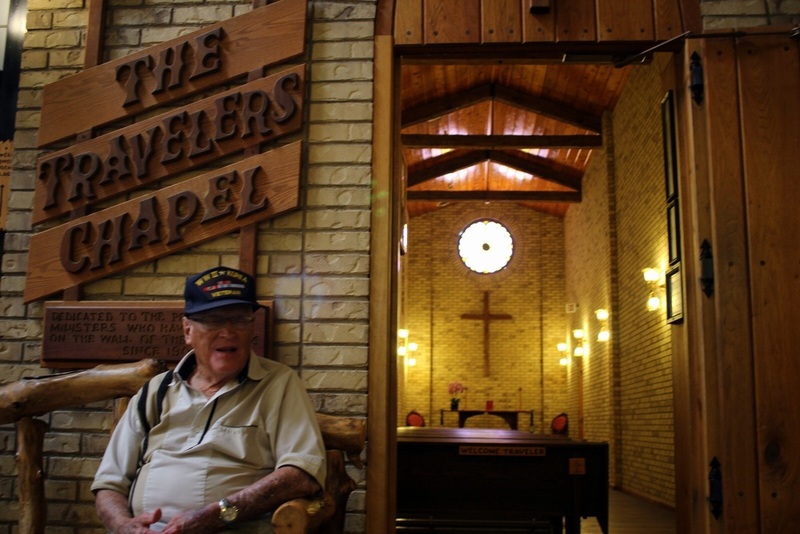 I saw a veteran hanging out by "The Travelers Chapel." He didn't mind that I took a shot of him. I bought a couple of Wall's famous donuts--one for now, and one as a post-run treat--and pressed onwards to the park. The landscape changed almost instantly. Up from the prairie were beautiful layered badland buttes. I had to stop by the road and take my first photos. The park was teeming with people. It was then that I realized that it was Labor Day Weekend--I'd lost track of the days. I soon realized that there was a chance that I wouldn't be able to get a campsite inside the park. The campground had around 80 sites, but would I be able to get one of them? I made it a point to get there ASAP. I'm glad I proceeded straight to the campground. When I arrived, only 2 sites were still open. I took one of them. It was already well past 2 p.m., and the sun was beating down on the prairie. I knew I needed to get out on the trails as soon as possible. My goal was to run every marked trail in the park, starting on Castle, proceeding to Saddle Pass, returning on Medicine Root, and then completing the Window, Door, and Notch trails. I quickly set up my tent, changed into running gear (including my Tilley hat--such an essential for the sun), and headed to the trailhead. Because I was going backcountry on a very hot day, I was worried about safety. 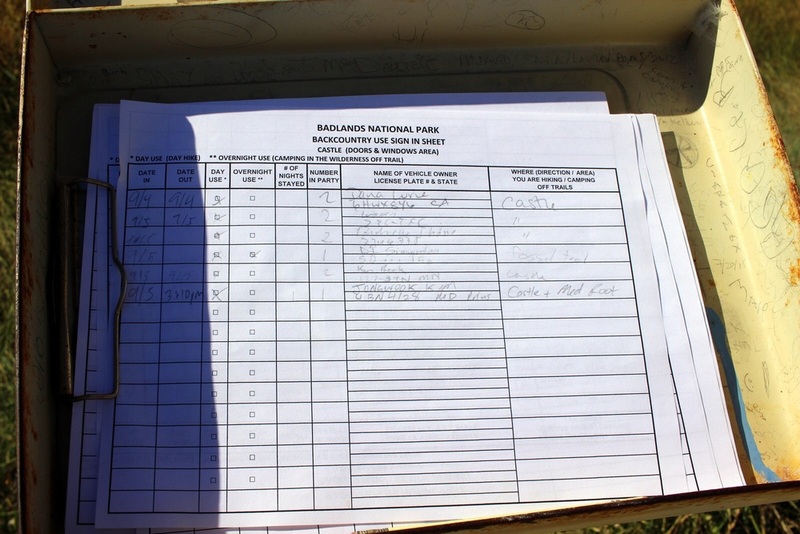 I made sure to sign every backcountry register I could find. 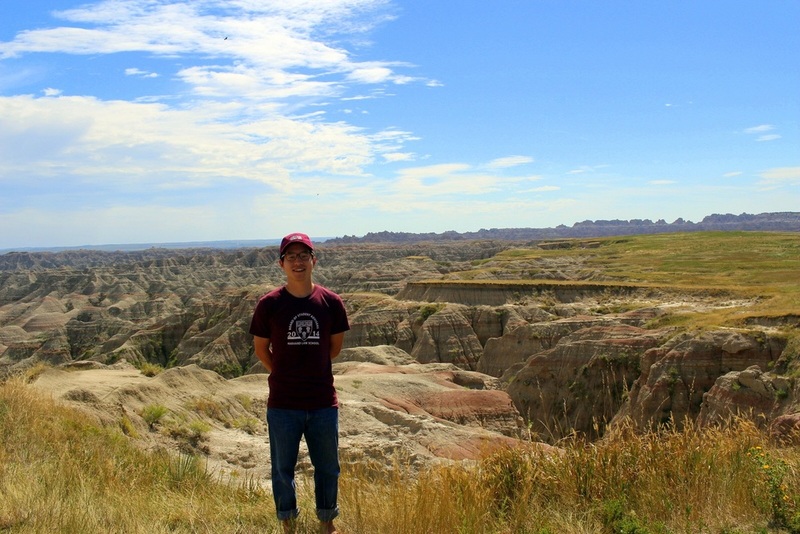 Almost immediately after setting off, I saw my first signs of movement in the badlands. 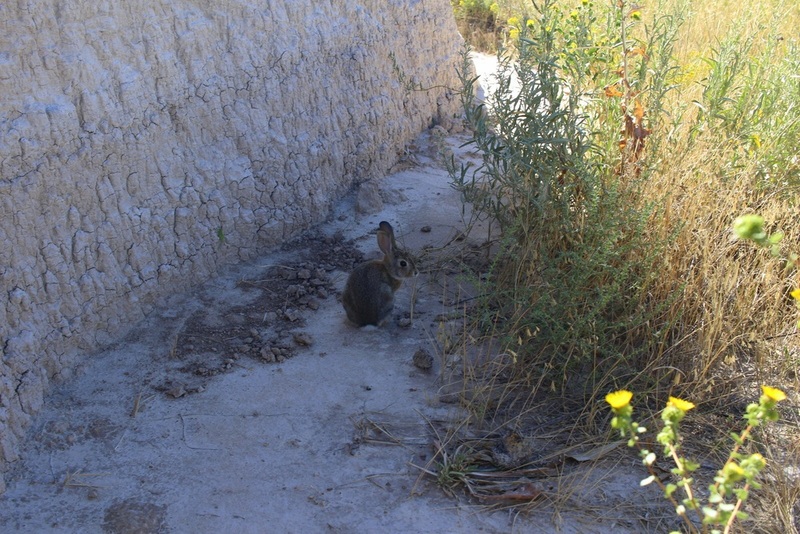 It was a desert bunny. He was super cute, and let me move quite close to him. 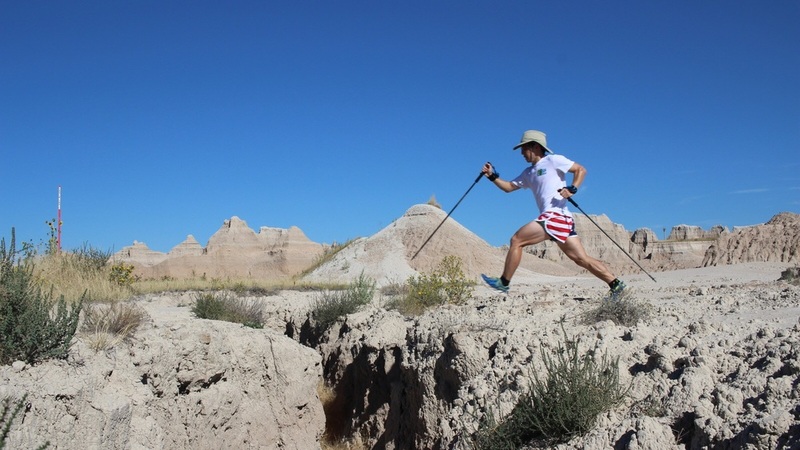 The trail needled out into the prairie and back towards the buttes, like a sine curve. The contrasts were wonderful, especially with a clear blue sky. It was an impressive environment. This felt far more dry and desert-like than the badlands of Theodore Roosevelt. Speaking of Theodore Roosevelt, I made sure to track the trail at all times. 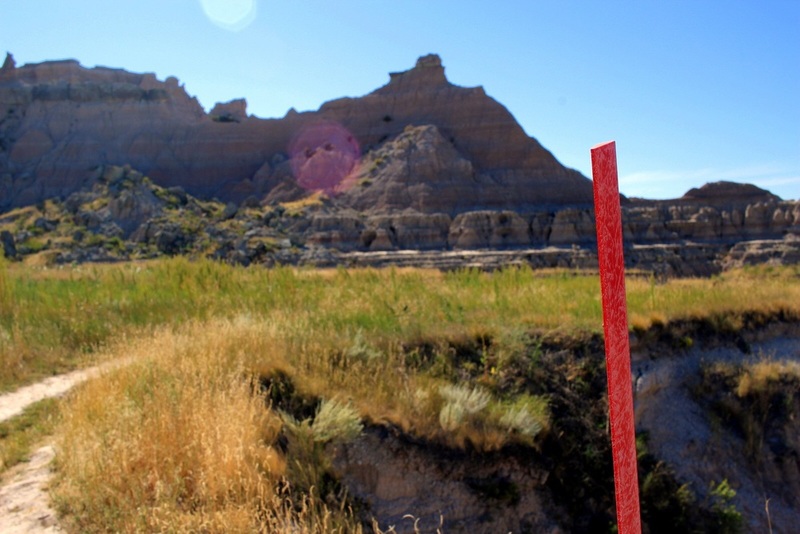 Compared to the ridiculousness of the Buckhorn Trail in Theodore Roosevelt, the Castle Trail was incredibly easy to follow--all you had to do was look for the red stakes, which were placed frequently along the trail. 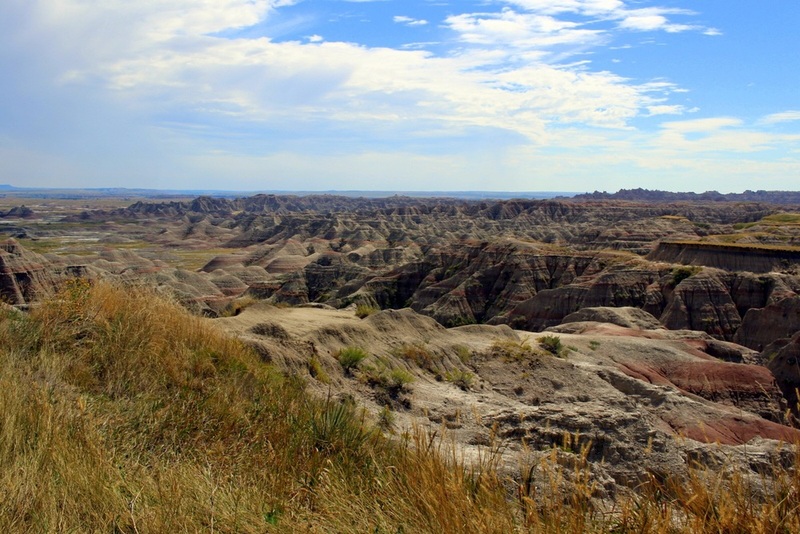 As I criss-crossed the badlands, I came across a little ravine. It was relatively narrow, and I thought I'd have a little bit of fun. So I decided to jump it. That was fun, dangerous, and worth it. Teddy Roosevelt would've been proud. I continued until I reached Saddle Pass. I noticed that there was a rock spire that one could climb. So I scrambled up it to get to this vista. Boy, was it incredible. I then reached the end of the 6-mile one-way Castle Trail. I turned around and headed back, but this time took the Medicine Root Trail, which veers out further into the prairie than the Castle. A couple hikers warned me that they'd heard a rattlesnake 10 minutes in front of me. I took that as a sign that I should slow down my speed. Given the heat, my heart rate was already starting to spike above where I wanted it to be. So I settled into a very appropriate desert pace--a steady, light-footed canter. I made it back to the trailhead. From there, I branched out to see the Door, Window, and Notch Trails. They were very similar to what I'd already seen. By this time, the sun was starting to set. 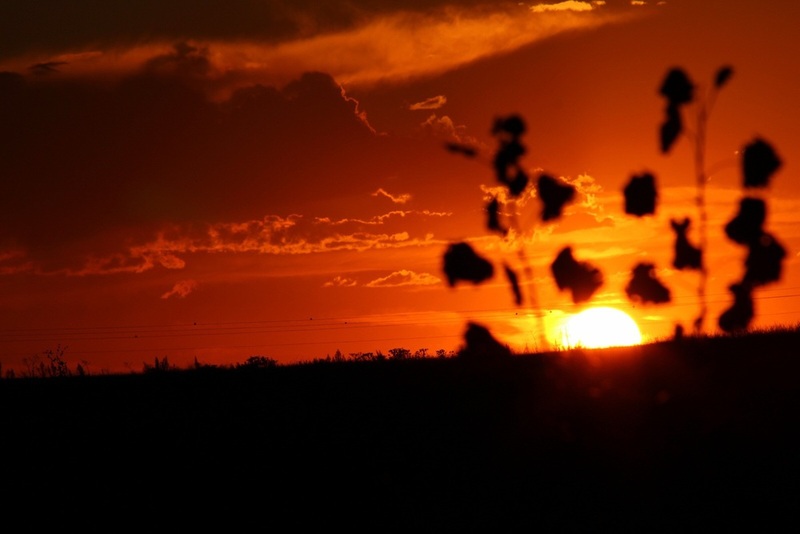 I made it back to my campsite and gazed at the sun setting behind the tall grass in the prairies to our west. It felt somewhat odd to have 80 or so campsites right in the middle of this expanse. I took a few photos to try and capture the juxtaposition of man and nature. I had an excellent night sitting beneath the stars and taking in the cool badlands air. I went to bed utterly at peace. Unfortunately, that peace was broken by the wind. It grew out of control at roughly 2:30 a.m. This was far worse than the thunderstorm. The tent walls whipped back and forth, and the base of the tent on the windward side actually began lifting up. I shifted all of my bags and even my own body to the windward side. It was terrifying. I realized I needed to reinforce the tent if I were to ever hope to fall back asleep. I stepped out of my tent to the whipping winds. The winds had been so strong that two corners of my tent stakes had come undone, and my guy lines were nowhere near taut enough. Not knowing how to prevent me and my tent from blowing off into the badlands like a tumbleweed, I frustratedly tried to load up a YouTube tutorial on how to set up a tent in strong wind. I finally got enough of the video loaded for me to realize that I'd been tying the guy lines wrong. Determined to stabilize my tent, I redid all of the guy lines and, this time, properly used the tensioner to make the lines taut. I looked up around me, and noticed that half the campground was also awake frantically scrambling to keep their tents on earth. It was a sight to see. I returned to my tent and closed my eyes. The whipping of the tent walls was less intense, but the noise was still out of control. I didn't sleep well. But that's okay. Because when I woke up before 6 a.m. from the whipping winds, I looked outside and saw this. Realizing that this was a special sunrise that was occuring, I rushed out to the prairie to find a good place to watch the rising sun. After cooking pancakes and making coffee, I hit the road again. A few miles from my campsite, I came across Interior, population 67. I didn't stop.